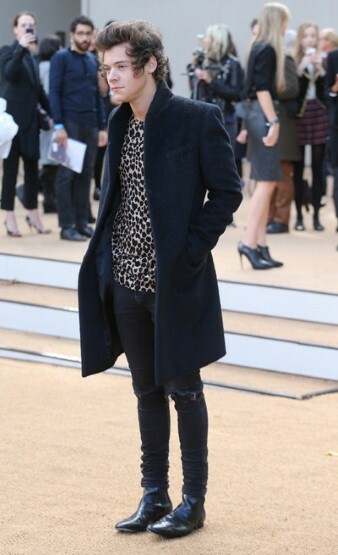 LittleEllieMae: London Fashion Week 2013- FROW Celebrity Fashion Spotting! London Fashion Week 2013- FROW Celebrity Fashion Spotting! I've spent my week stuck in school doing various horrible exams and coursework, although wishing that I could be at London Fashion Week - constantly. Its a dream of mine to attend there one day, but for now I will observe and blog about it. I want to start off with my favourite - Pixie Lott, in my opinion, looked amazing at the Temperley show! I don't know what it is about this outfit, but I adore it! Its not something that I'd usually like, but with the simplicity of her hair-do with the dark coloured dress and the gorgeous gothic lip colour - it totally works. I love the gothic/ punk-y kind of fashion at the moment, and I think that Pixie showcases it brilliantly. Paloma Faith always pulls out all the stops, and she certainly didn't disappoint at the Julien MacDonald show! I think she looks so classy and elegant, which is always nice to see these days. I really love the gold detailing on her left side of the dress and the dress shows off her beautiful figure so nicely. Nice one Paloma! I had to include the lovely Dionne Bromfield in this post, I was talking to her about LFW yesterday and she had a great time! Dionne always looks stunning, especially here- I adore her LBD with animal print, its so on trend and cute! The necklace adds a huge element of glam to the look and completes it nicely! Does Kate Moss ever look bad?! NOPE! She attended the Topshop show with her daughter wearing this casual yet glam outfit. The trousers are gorgeous- again following the animal print trend, as did Dionne. Its a very sophisticated monochrome look, but she adds a hint of colour with her blue clutch bag which I think is very cute! I am a huge fan of Alexa Chung's boyish, yet sophisticated style! When I first spotted her in this amazing animal print (again?! I can tell this is going to be a big trend...) coat I think my jaw literally fell open in awe- I am in love with it. I am yet to find out where the coat is from, so if you have any idea please let me know! Anyway, I just think that this outfit is great, and Alexa wears it so well! I'm sorry. I really am, but I HAD to include Mr Harry Styles in this post. I am a huge Directioner (if you didn't know already!!) and I think that Harry looked flawless at a show he attended. I love big coats like this on guys, and I just think that he looks great. Everything about him - great. Okay, I'll stop now. So that's a round up of some of my favourite celebrity looks from the FROW at London Fashion Week 2013, hope you love it as much as I do! Have a great week! I just want to apologise if there is a lack in blog posts over the next couple of weeks- I am super busy at school (sigh) and I'm getting ready for my 16th birthday party (look forward to lots of party themed posts and videos soon!) but I will post as much as I can! Thanks for sticking with me! Paloma Faith has got to be my favourite here, the way her hair stood out on the Burberry front row was amazing! Kate Moss looks so amazing all the time. She's perfection!